HAVING listened with attention to that which has been said concerning the worship of the Supreme Brahman, the Supreme Devi greatly pleased again thus questioned Shankara (1). O Lord of the Universe and Husband! I bathe with contentment in the nectar of Thy words concerning the excellent worship of the Supreme, which lead to the well-being of the world and to the path of Brahman, and gives light, intelligence, strength, and prosperity (2-3). Thou hast said, 0 Ocean of Mercy! that as union with the Brahman is attainable through worship of Him, so, it may be attained by worship of Me (4). I wish to know, O Lord! of this excellent worship of Myself, which as Thou sayest is the cause of union of the worshipper with the Brahman (5). What are its rites, and by what means may it be accomplished? What is its Mantra, and what the form of its meditation and mode of worship? (6). O Shambhu! who but Thee, great Physician of earthly ills, is fit to speak of it, from its beginning to its end, and in all its detail agreeable as it is to Me and beneficent to all humanity? (7). Listen, O Thou of high fortune and destiny, to the reasons why Thou shouldst be worshipped, and how thereby the individual becomes united with the Brahman (9). 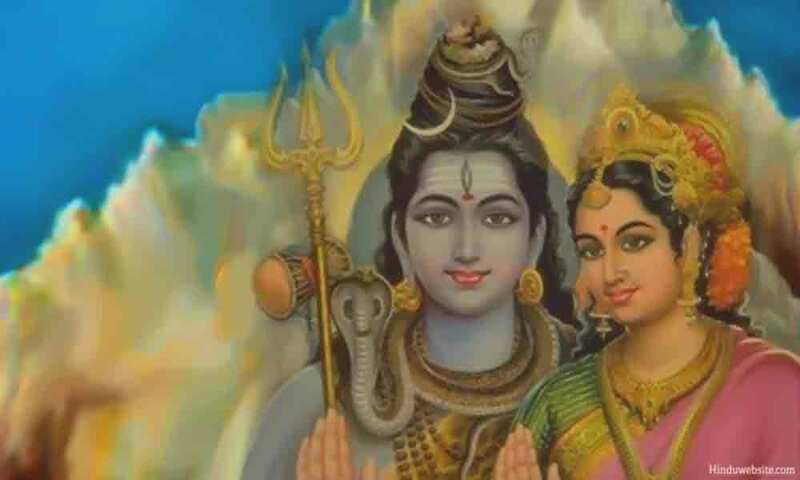 Thou art the only Para Prakriti of the Supreme Soul Brahman, and from Thee has sprung the whole Universe O Shiva its Mother (10). O gracious One ! whatever there is in this world, of things which have and are without motion, from Mahat to an atom, owes its origin to and is dependent on Thee (11). Thou art the Original of all the manifestations; Thou art the birthplace of even Us; Thou knowest the whole world, yet none know Thee (12). Thou art Kali, Tarini, Durga, Shodashi, Bhuvaneshvari, Dhumavati. Thou art Bagala, Bhairavi, and Chhinna-mastaka. Thou art Anna-purna, Vagdevi, Kama-lalaya. Thou art the Image or Embodiment of all the Shaktis and of all the Devas (13-14). Thou art both Subtle and Gross, Manifested and Veiled, Formless, yet with form. Who can understand Thee? (15). For the accomplishment of the desire of the worshipper, the good of the world, and the destruction of the Danavas, Thou dost assume various forms (16). Thou art four-armed, two-armed, six-armed, and eight-armed, and holdest various missiles and weapons for the protection of the Universe (17). In other Tantras I have spoken of the different Mantras and Yantras, with the use of which Thou shouldst be worshipped according to Thy different forms, and there, too, have I spoken of the different dispositions of men (18). In this Kali Age there is no Pashu-bhava: Divya-bhava is difficult of attainment, but the practices relating to Vira-sadhana yield visible fruit (19). In this Kali Age, O Devi! success is achieved by Kaulika worship alone, and therefore should it be performed with every care (20). By it, O Devi! is acquired the knowledge of Brahman, and the mortal endowed therewith is of a surety whilst living freed from future births and exonerated from the performance of all religious rites (21). According to human knowledge the world appears to be both pure and impure, but when Brahma-jnana has been acquired there is no distinction between pure and impure (22). For to him who knows that the Brahman is in all things and eternal, what is there that can be impure? (23). Thou art the Image of all, and above all Thou art the Mother of all. If Thou art pleased, O Queen of the Devas! then all are pleased (24). Before the Beginning of things Thou didst exist in the form of a Darkness which is beyond both speech and mind, and of Thee by the creative desire of the Supreme Brahman was the entire Universe born (25). This Universe, from the great principle of Mahat down to the gross elements, has been created by Thee, since Brahman Cause of all causes is but the instrumental Cause (26). It is the Ever-existent, Changeless, Omnipresent, Pure Intelligence unattached to, yet existing in and enveloping all things (27). It acts not, neither does It enjoy. It moves not, neither is It motionless. It is the Truth and Knowledge, without beginning or end, Ineffable and Incomprehensible (28). Thou the Supreme Yogini dost, moved by his mere desire, create, protect, and destroy this world with all that moves and is motionless therein (29). Mahakala, the Destroyer of the Universe, is Thy Image. At the Dissolution of things, it is Kala Who will devour all (30), and by reason of this He is called Mahakala, and since Thou devourest Mahakala Himself, it is Thou who art the Supreme Primordial Kalika (31). Because Thou devourest Kala, Thou art Kali, the original form of all things, and because Thou art the Origin of and devourest all things Thou art called the Adya Kali (32). Resuming after Dissolution Thine own form, dark and formless, Thou alone remainest as One ineffable and inconceivable (33). Though having a form, yet art Thou formless; though Thyself without beginning, multiform by the power of Maya, Thou art the Beginning of all, Creatrix, Protectress, and Destructress that Thou art (34). Hence it is, 0 Gentle One! that whatsoever fruit is attained by initiation in the Brahma-Mantra, the same may be had by the worship of Thee (35). According to the differences in place, time, and capacity of the worshippers I have, O Devi! in some of the Tantras spoken of secret worship suited to their respective customs and dispositions (36). Where men perform that worship which they are privileged to perform, there they participate in the fruits of worship, and being freed from sin will with safety cross the Ocean of Being (37). By merit acquired in many previous births the mind inclines to Kaulika doctrine, and he whose soul is purified by such worship himself becomes Shiva (38). Where there is abundance of enjoyment, of what use is it to speak of Yoga, and where there is Yoga there is no enjoyment, but the Kaula enjoys both (39). If one honours but one man versed in the knowledge of the essence of Kula doctrine, then all the Devas and Devis are worshipped there is no doubt of that (40). The merit gained by honouring a Kaulika is ten million times that which is acquired by giving away the world with all its gold (41). A Chandala versed in the knowledge of Kaulika doctrine excels a Brahmana, and a Brahmana who is wanting in such knowledge is beneath even a Chandala. (42). I know of no Dharmma superior to that of the Kaulas, by adherence to which man becomes possessed of Divine knowledge (43). I am telling Thee the truth, O Devi! Lay it to the heart and ponder over it. There is no doctrine superior to the Kaulika doctrine, the most excellent of all (44). This is the most excellent path kept hidden by reason of the crowd of Pashus, but when the Kali Age advances this pathway will be revealed (45). As in the Satya, Treta, and Dvapara Ages wine and the like could be taken, so they may be taken in the Kali Age in accordance with the Kaulika Dharmma (56). The Kali Age cannot harm those who are purified by truth, who have conquered their passions and senses, who are open in their ways, without deceit, are compassionate and follow the Kaula doctrine (57). The Kali Age cannot harm those who are devoted to the services of their Guru, to the lotus of their mothers feet, and to their own wives (58). The Kali Age cannot harm those who are vowed to and grounded in truth, adherents of the true Dharmma, and faithful to the performance of Kaulika rites and duties (59). The Kali Age cannot harm those who give to the truthful KaulikaYogi the elements of worship, which have been previously purified by Kaulika rites (60). The Kali Age cannot harm those who are free of malice, envy, arrogance, and hatred, and who are firm in the faith of Kaulika dharmma (61). The Kali Age cannot harm those who keep the company of Kaulikas, or live with Kaulika Sages, or serve the Kaulikas (62). The Kali Age cannot harm those Kaulikas who, whatever they may appear outwardly to be, yet remain firm in their Kaulika Dharmma, worshipping Thee according to its doctrine (63). The Kali Age cannot harm those who perform their ablutions, charities, penances, pilgrimages, devotions, and offerings of water according to the Kaulika ritual (64). The Kali Age is but the slave of those who are free of all crookedness and falsehood, men of candour, devoted to the good of others, who follow Kaulika ways (67). In spite of its many blemishes, the Kali Age possesses one great merit, that from the mere intention of a Kaulika of firm resolution desired result ensues (68). In the other Ages, O Devi! effort of will produced both religious merit and demerit, but in the Kali Age men by intention merely acquire merit only, and not demerit (68). The slaves of the Kali Age, on the other hand, are those who know not Kulachara, and who are ever untruthful and the persecutors of others (70). They too are the slaves of the Kali Age who have no faith in Kulacharas, who lust after others wives, and hate them who are faithful to Kaulika doctrine (71). In speaking of the customs of the different Ages, I have, O Gentle One! and out of love, O Parvati! truly recounted to Thee the signs of the dominance of the Kali Age (72). When the Kali Age is made manifest, piety is enfeebled and Truth alone remains; therefore should one be truthful (73). O Thou Virtuous One! know this for certain, that whatsoever man does with Truth that bears fruit (74). There is no Dharmma higher than Truth, there is no sin greater than falsehood; therefore should man seek protection under Truth with all his soul (75). Worship without Truth is useless, and so too without Truth is the Japa of Mantras and the performance of Tapas. It is in such cases just as if one sowed seed in salt earth (76). Truth is the appearance of the Supreme Brahman; Truth is the most excellent of all Tapas; every act is rooted in Truth. Than Truth there is nothing more excellent (77). Therefore has it been said by Me that when the sinful Kali Age is dominant, Kaula ways should be practised truthfully and without concealment (78). Truth is divorced from concealment. There is no concealment without untruth. Therefore is it that the Kaulika-sadhaka, should perform his Kaulika-sadhana openly (79). What I have said in other Kaulika Tantras about the concealment of Kaulika-dharmma not being blameworthy is not applicable when the Kali Age becomes strong (8o). In the (First or) Satya. Age, O Devi! Virtue possessed the four quarters of its whole; in the Treta Age it lost one-quarter of its Virtue; in the Dvapara Age there was of Virtue but two quarters, and in the Kali Age it has but one (81). In spite of that Truth will remain strong, though Tapas and Charity become weakened. If Truth goes Virtue goes also, therefore of all acts Truth should be the abiding support (82). O Sovereign Mistress of the Kaula-Dharmma! since men can in this Age have recourse to Kaulika Dharmma only, if that doctrine be itself infected with untruth, how can there be liberation? (83). With his soul purified in every way by Truth, man should, according to his caste and stage of life, perform the following acts in the manner shown by Me (84): initiation, worship, recitation of Mantras, the worship of Fire with ghee, repetition of Mantras, private devotions, marriage, the conception ceremony, and that performed in the fourth, sixth, or eighth months of pregnancy, the natal rite, the naming and tonsure ceremonies, and obsequial rites upon cremation and after death. All such ceremonies should be performed in the manner approved by the Agamas (85-86). The ritual which I have ordained should be followed, too, as regards Shraddha at holy places, dedication of a bull, the autumnal festival, on setting out on a journey, on the first entry into a house, the wearing of new clothes or jewels, dedication of tanks, wells, or lakes, in the ceremonies performed at the phases of the Moon, the building and consecration of houses, the installation of Devas, and in all observances to be performed during the day or at night, in each month, season, or year, and in observances both daily or occasional, and also in deciding generally what ought and what ought not to be done, and in determining what ought to be rejected and what ought to be adopted (87-90). Should one not follow the ritual ordained, whether from ignorance, wickedness, or irreverence, then one is disqualified for all observances, and becomes a worm in dung (91). O Maheshi! if when the Kali Age has become very powerful any act be done in violation of My precepts, then that which happens is the very contrary of that which is desired (92). Initiation of which I have not approved destroys the life of the disciple, and his act of worship is as fruitless as oblations poured on ashes, and the Deva whom he worships becomes angry or hostile, and at every step he encounters danger (93). Ambika! he who during the dominance of the Kali Age, knowing My ordinances, yet performs his religious observances in other ways, is a great sinner (94). The man who performs any Vrata, or marries according to other ways, will remain in a terrible Hell so long as the Sun and Moon endure (95). By his performance of Vrata he incurs the sin of killing a Brahmana, and similarly by being invested with the sacred thread he is degraded. He merely wears the thread, and is lower than a Chandala (96), and so too the woman who is married according to other ways than Mine is to be despised, and, 0 Sovereign Mistress of the Kaulas! the man who so marries is her associate in wrong, and is day after day guilty of the sin of going with a prostitute (97). From him the Devata will not accept food, water, and other offerings, nor will the Pitris eat his offerings, considering them to be as it were mere dung and pus (98). Their children are bastards, and disqualified for all religious, ancestral, and Kaulika observances and rites (99). To an image dedicated by rites other than those prescribed by Shambhu the Deva never comes. Benefit there is none either in this or the next world. There is but mere waste of labour and money (100). A Shraddha performed according to other rites than those prescribed by the Agamas is fruitless, and he who performs it will go to Hell together with his Pitris (101). The water offered by him is like blood, and the funeral cake like dung. Let the mortal then follow with great care the precepts of Shankara (102). What is the need of saying more? Verily and verily I say to You, O Devi! that all that is done in disregard of the precepts of Shambhu is fruitless (103). For him who follows not His precepts there is no future merit. That which has been already acquired is destroyed, and for him there is no escape from Hell (104). O Great Ruler! the performance of daily and occasional duties in the manner spoken of by Me is the same as worshipping Thee (105). Listen, O Devi! to the particulars of the worship with its Mantras and Yantras, which is the medicine for the ills of the Kali Age (106). End of the Fourth Chapter, entitled "Introduction of the Worship of the Supreme Prakriti."